Last week to participate in the China Pharmaceutical Raw Materials Exhibition (CPHI), in the above see the peristaltic pump in medicine, medical field widely used. All of a sudden to enhance the confidence of a lot, the prospect of peristaltic pump is also extremely optimistic about the following I told you about the medical device above the application of peristaltic pump. After our research on the market, we see about 80% of the medical, pharmaceutical companies will use peristaltic pump, some used in the Ming, some used in the dark, there are some unused, and their equipment above some of the original can Use a peristaltic pump instead. However, now in the medical, medical field above the peristaltic pump or foreign brands, which is determined by a number of factors, the first medical field of peristaltic pump requirements are relatively high, in the previous period, domestic peristaltic pump may indeed have to be Improvement, which led to the foreign brand in that period quickly opened the market, occupied the people's awareness. But the price of foreign brands peristaltic pump is often several times the domestic product or even ten times, which invisible which increased their cost. This is the opportunity to break through the domestic products, and now the domestic product quality is enough to compare with the imported products, and the price above the advantage is very, very large. It seems that the domestic peristaltic pump manufacturers must seize this opportunity to develop rapidly. In this, our company will seize the opportunity to develop rapidly. 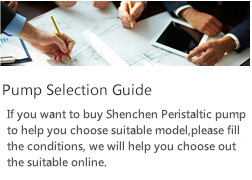 Strive to continue to expand the advantages of our peristaltic pump industry.